Garlic, my number one vegetable. I adore garlic and have been growing and saving my own for years. It's wonderful in the kitchen, complementing so many dishes, and it is also very easy to grow. It's up there with Sorrel as being one of the easiest Spoonie Veg to grow. This post goes into a bit more detail than my usual Spoonie Veg posts. This is because garlic is one of my 'specialities' (the other being potatoes) and I save cloves from each season to grow the following year. But it's also because garlic is so easy to grow and save your own cloves, that I thought it was worth including the extra detail. Just remember I am an amateur, and all information is based on my c. 10 or so years of growing garlic, but isn't expert. In my post introducing Spoonie Veg, I gave Garlic a rating of 1. That being: 1-2 requires few spoons, 3-4 moderate spoons, and 5 hard, lots of spoons needed in order to grow that fruit, veg or herb. Hardneck garlic, Allium sativum var. ophioscorodon: always produces a flower stalk (called a scrape), is considered to have a stronger flavour, and has shorter storage qualities (more on that later). Softneck garlic, Allium sativum: doesn't produce a flower stalk unless stressed, has better storage qualities. Otherwise they share the same growing conditions. Like most vegetables, they don't like acid soil, but do like well-draining soil. A lot of people have problems growing garlic in clay soils. At my old allotment in Oxford I was growing on heavy Oxford clay and interestingly found some of hardnecks did ok despite this, for instance, Georgia Fire and Persian Star. 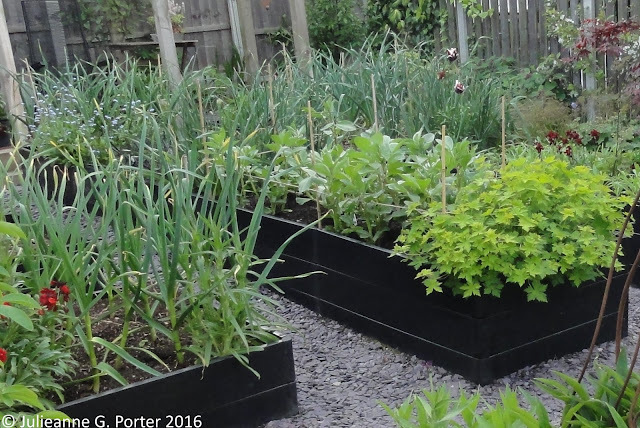 Here in Sheffield my soil is the wonderful combination of acid and clay, which is why I have 45cm deep raised beds. These have been filled with compost and well-rotted manure with a top up each autumn. This has worked well with growing garlic and I always get a good harvest. Depending on the variety you can sow either in Autumn or Spring. 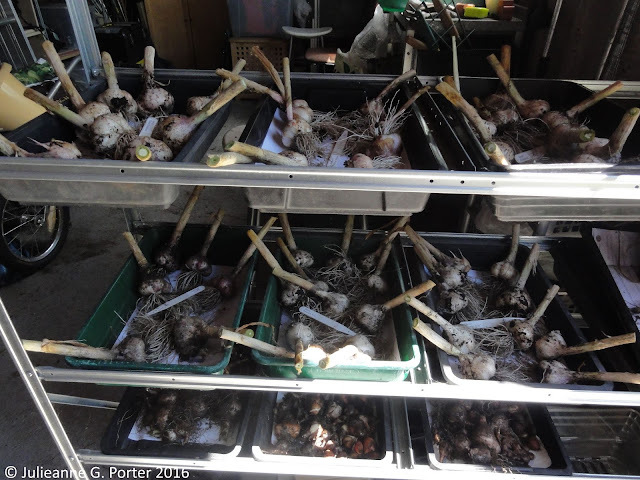 I always grow autumn-sowing garlic, sowing October/November. This preference is mainly due to liking to know something is growing in the kitchen garden over winter! But there is also a practical reason, in that garlic generally needs a period of cold (0 degrees and below) to break it's dormancy. A warmer winter can mean you end up with small bulbs, or even just one big clove. 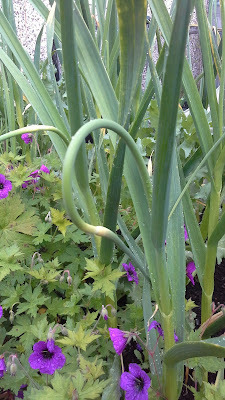 I space the garlic out first in a zig-zag pattern, then push it in so it is covered by about 3-4 inches of soil. If you have heavy clay, just put it a couple of inches. 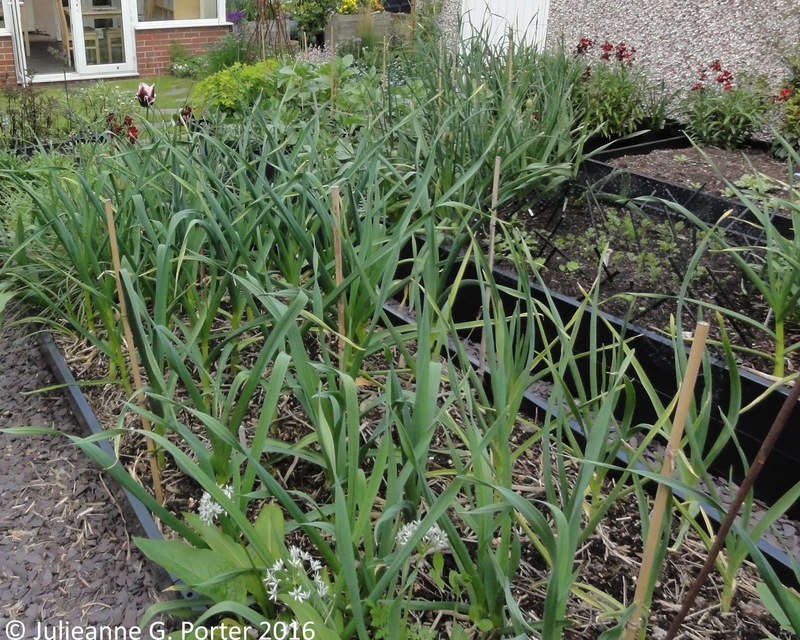 See my 2012 post on Getting the garlic in for more detail about planting including spacing. Once in the ground, there is very little to do until about mid-Spring. The key maintenance task with garlic is watering. This is key during the peak growing period (approximately April-June) or during a dry Spring. I also give them a feed of comfrey liquid a couple of times during April-June. 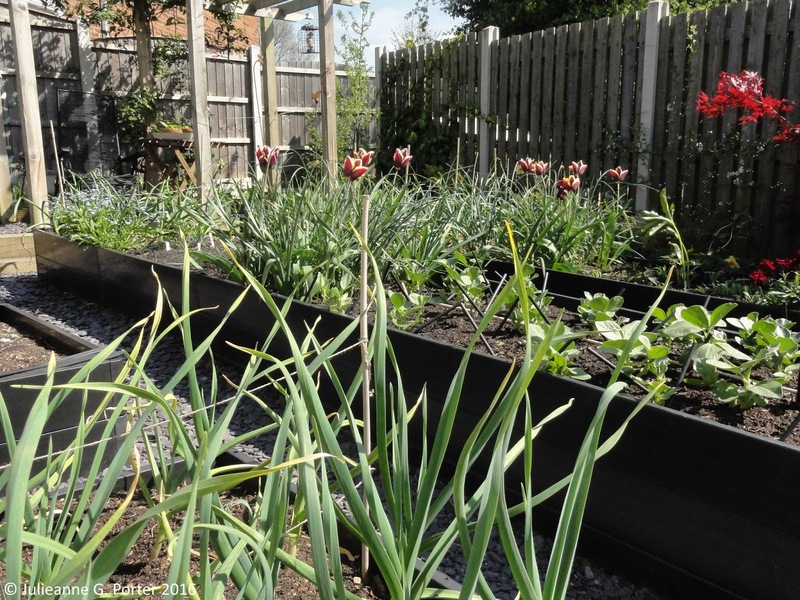 Also keep on top of the weeds so they don't take nutrients away from the developing bulbs. 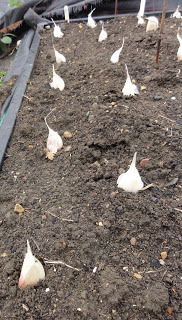 If you are growing Hardneck Garlic (most of mine are), then you also need to watch out for the garlic scrapes coming up around May/June, as in the photos below. They come up straight then turn into a hook. These need to be cut off as soon as you see them, as otherwise all the energy is put into the scrape and you end up with small bulbs. On the plus side, the scrapes means you can make garlic scrape pesto. I've also use them instead of garlic cloves in a recipe, one scrape equals one clove. Softneck garlic does not produce a scrape (unless stressed) so you don't need to look out for them. Garlic scrapes. On the left is the young scrape just showing, on the right when it's turned into a hook. 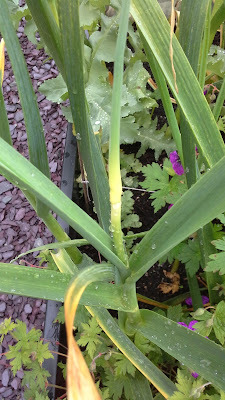 The main disease garlic is susceptible to is garlic rust (the same thing leeks get), but this doesn't actually affect the bulb so is only a cosmetic problem. One I never bother worrying about. Harvesting usually starts from July. Basically, once the leaves start turning yellow and are dying back, you don't need to do any more watering and you can start to dig up your garlic. Having a chronic illness means I fit digging garlic up around my health. It can mean I might have left them in the ground for too long, in which case they might start splitting. However, I don't worry about splitting as I haven't found it affects the taste or storage qualities of the bulb. Garlic can also be grown in containers. 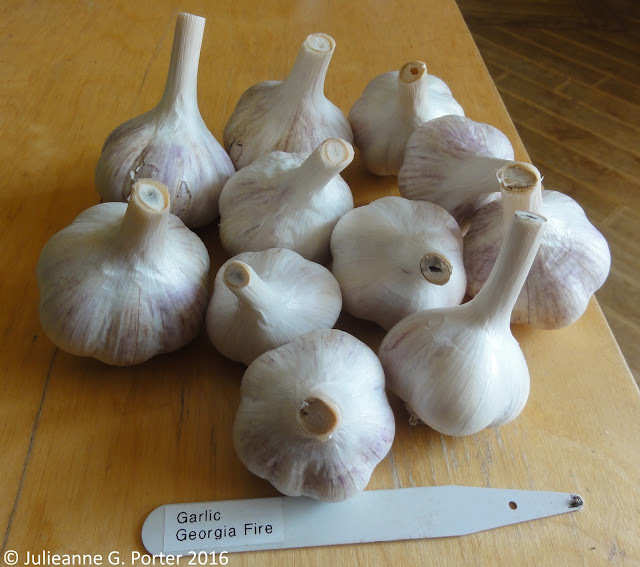 I've recently blogged about my experiment of growing garlic in containers, so visit that post if you would like to know more about it. You won't get as big bulbs growing in containers, but I did find that 3 cloves sown in a 10 litre pot will give you the equivalent of 2 bulbs grown in the ground or raised beds. Once I've harvested the garlic, I cut off a bulk of the foliage just leaving a short stem. I sort through to make sure I pull out any that are going mouldy. This isn't many, just those that weren't as strong or where water got into clove. I then dry them out for a few weeks. Garlic drying out after harvesting in my garage. I then do a second sort through the bulbs and clean them. This consists of cutting off the roots and taking of any dirty layers of the outer bulb skin. At this point you can better assess the bulbs for saving and storage. I separate them out and then allow them all to dry out for another couple of weeks. If you have a chronic illness then you might want to skip saving your own cloves, and instead buy new ones for sowing in Autumn. That's what I do with most veg now as I don't have the energy to save all my own seed as well. 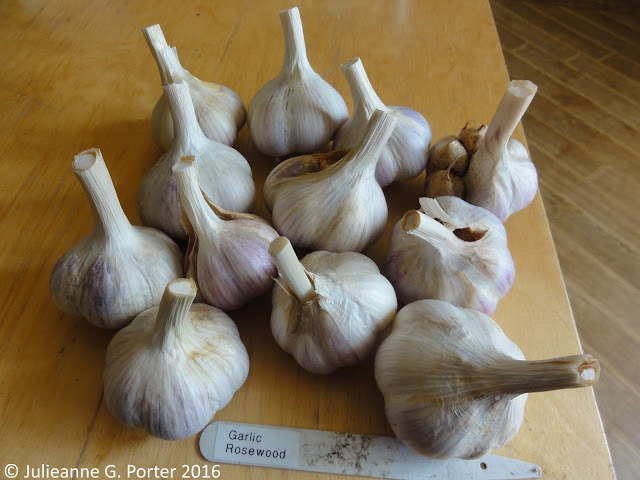 However, because garlic is my 'thing' and I'm growing hard-to-get varieties, I'm willing to use extra spoons saving these and growing them on the following season. 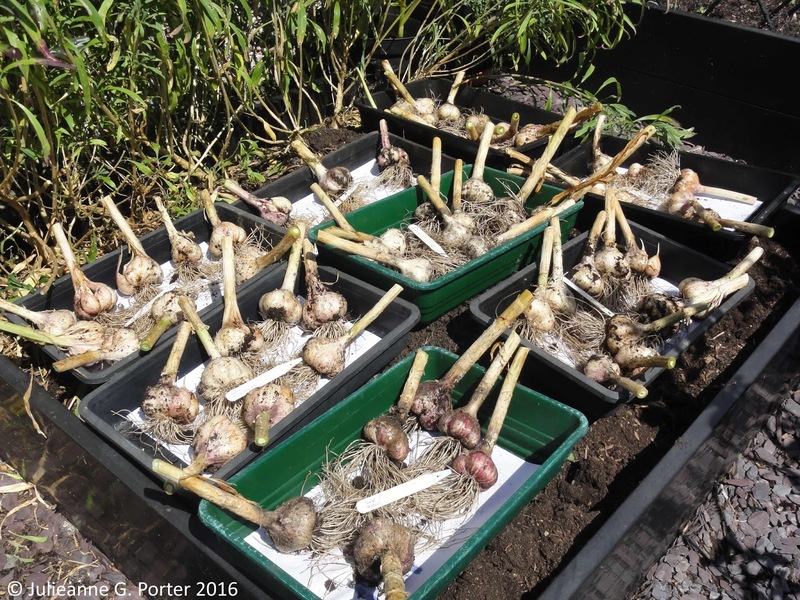 The following picture shows the garlic cleaned up, with the best ones in a separate bag which I'll use for planting in October/November. 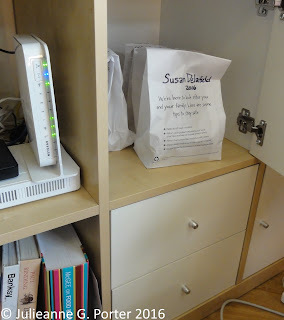 And yes, that is pharmacy prescription bags being repurposed as bags for storing garlic. The very best bulbs that have the most number of outer cloves and clearly have no disease etc, are then separated out for saving. I've been compiling a Garlic Record (see end of post) to compare each variety to past results. For saving garlic, like with seeds, having a larger number of plants in the first place from which to choose those for saving, is best. As I only have a small garden I cannot do this. However, I've been growing these varieties since 2009 and I am not having any problems with a decrease in vigour. Hardneck garlic isn't meant to store as well as Softneck garlic. The RHS says only until mid-winter. However, I've found that in optimal conditions, my Hardnecks all store just as well as the Softnecks I've grown in the past. By the end of September latest, I bring inside those bulbs that I have put aside for eating. As for the place I store them, well this might seem a little odd, but I store them in a cupboard in my lounge room (right)! I've tried storing them in other rooms and spaces, but of them all, my lounge has the most consistent temperature throughout the year and the bulbs store there better than anywhere else I've tried. Where ever you store them, don't leave them in the garage or shed over winter as they will probably start getting mouldy and will rot from the cold and the freezing air quite quickly. Random person: But you cannot cook anything without onions. Me: Yes you can, use garlic. Random person: But the recipe includes both onion and garlic. Garlic is versatile in the kitchen and is one of the easiest Spoonie Veg to grow. Give it a try and let me know how you get on. Update 18th October 2016: I've now sent out all garlic for the giveaway this year. This section is for those of you who are garlic lovers and are interested in growing unusual varieties. As mentioned, I grow 8 different varieties of garlic, given to me back in 2009 by Patrick over at Bifurcated Carrots. I used to grow 16 varieties, but weeded out the ones that were either too strong (almost burn your throat strong) or which didn't grow to good sized bulbs. The eight varieties I grow are: Georgia Fire, Martin's Heirloom, Metechi, Music, Persian Star, Rosewood, Silver Rose, Susan Delafield. Of these, Silver Rose is the only softneck variety, the rest are hardnecks. I've been compiling a bit of an imperfect(!) record of the different garlic I have grown since 2010. Below are links to my garlic records. The first is those I am currently growing. The second is those I used to grow but do not any longer, but which may be of interest to some people. 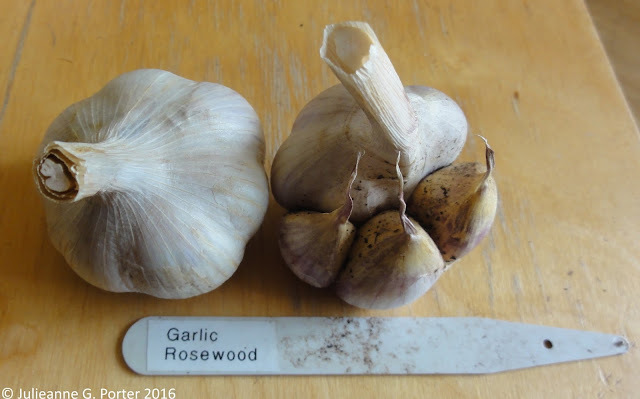 I know I have enough garlic to sow and eat for the next year and am able to do a limited giveaway of some cloves the following varieties: Georgia Fire, Music, Persian Star, Rosewood, Susan Delafield. If you are interested in growing them, I'll be happy to send some to you (UK only). My only ask is that you let me know how you got on with them when you harvest the garlic next summer. Email me which ones you are interested in at: jgp@cooptel.net by Friday 7th October. This is a really helpful post, thank you! If I ever decide to grow veg, I'm going to start with garlic! 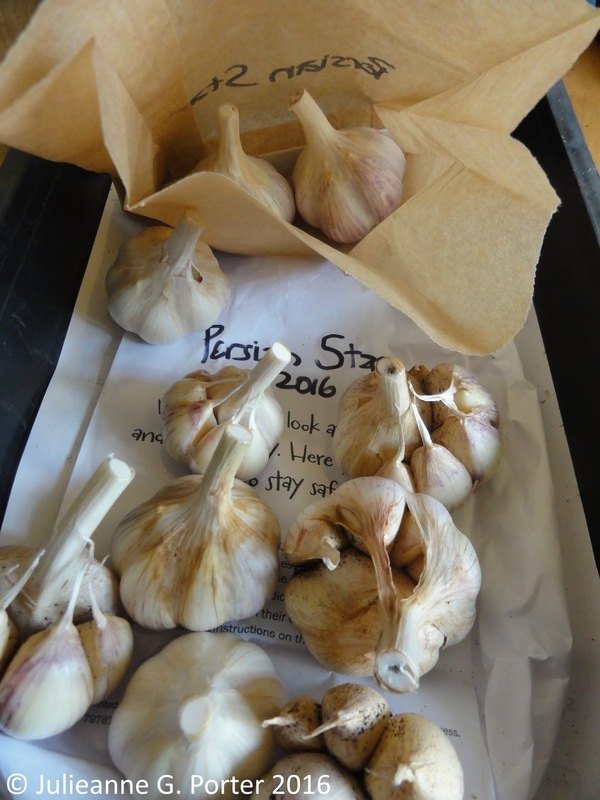 I think saving some bulbs to plant the cloves the following year makes financial sense too – they’re not that cheap to buy from seed catalogues when you factor in postage and packaging.